alaTest has collected and analyzed 349 reviews of Philips Hue GU10. The average rating for this product is 4.6/5, compared to an average rating of 4.5/5 for other products in the same category for all reviews. We analyzed user and expert ratings, product age and more factors. 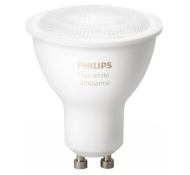 Compared to other products in the same category the Philips Hue GU10 is awarded an overall alaScore™ of 89/100 = Very good quality. They are pricey but they are great definitely wait for deals on them as I got all mine with the 3 for the price of 2 on them. Love all the features with the bulbs great bit of home technology with really easy functions. Our new house has a huge amount of ceiling spot lights. We bought these bulbs to use with an Amazon echo dot. Now we can put specific spot lights on, on their own instead of turning all 10 on at once.